You were born to speak with Richard Newman – Art, Food, Travel and Fashion! Apparently almost half of people (47%) want to change their job? * They may be held back from getting a new job by fear of doing an interview, presentation or pitching a new business. In fact, public speaking is feared more than death, in some studies! Did you know that with no change to what you wear, or even what you say, people in business can be 42% more convincing with a few simple changes to their communication style? Some people believe you are either born with great communication skills or you’re not. In fact, humans are born with extraordinary communication skills. 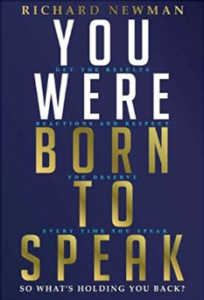 Bad habits and negative events can diminish your natural skills, but if you return to the way you were born to speak you can gain the results, reactions and respect you deserve. Richard has been studying and teaching communication for 23 years, working with 50,000 clients from all over the world. Richard overcame his own fear of public speaking and built a multi-million pound communication training company. The book focuses on the three critical areas you need in order to communicate your ideas powerfully – Style, Story and State. Only by having a terrific communication style, great storytelling and a peak performance mindset can you achieve your full potential and make your ideas happen. Richard studied communication while living in a Tibetan monastery for 6 months without access to the internet, smart phones and rarely had electricity. The monks couldn’t speak English so they had to work out how to communicate non-verbally. He then trained at a London acting school, working on stage presence, voice and storytelling. Next he gave 1000 presentations for a Formula 1 team, to VIPs from all over the world. His experience from all of these areas, as well as teaching international clients is all in the book. One of Richard’s clients gained £1.2billion in new business in one year, winning every bid they pitched for, by applying the techniques you’ll learn in this book. An entrepreneur who had been turned down for investments learned a few of the techniques that are in the book and then went back to pitch his idea to the same investors and gained £500,000 from one of them. Same idea, different delivery, using the strategies from the book.